Implementation of planned maintenance work on machinery, equipment and infrastructure. Carrying out repairs and coordination of special operations. Tool repairs and manufacture of new tools, as well as the production of spare parts and samples. Implementation of structural steel, sheet metal processing and welding. Construction of production facilities by custom-made. Construction of tools, appliances, mechanical systems and components by custom-made. Cupping, mold, turning and mill, in the range of series production. 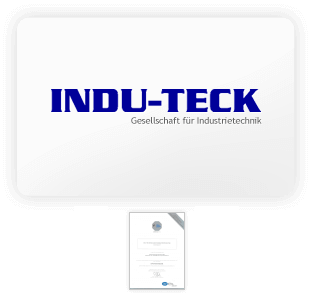 "Indu-Teck stands for high quality services, reliability and highly motivated employees." Our company was founded in 1987. Through constant training of employees and by establishing a quality management according to ISO 9001 enables us to meet our business partners’ needs. Due to the wide range of our business activities, including associated engineering, we have an ideal combination to implement cost effective and reliable solutions, and executing at a high level of quality. Our company size, structure and organization enables us nationwide and short-term tasks to perform to their full satisfaction. You’ll need the free PDF-Reader of Adobe (external download-link) .